EABA – the End All, Be All of roleplaying systems. No, not really, the day someone writes that is the day I spontaneously combust. EABA is rather good though. Right at the start of the product, in the list of ‘other credits’, there’s a list of RPGs that have helped inspire EABA. D&D, CoC, Champions, GURPS, Over the Edge, Timelords, 3G³ and CORPS. Those last three there are other games designed by EABA’s designer Greg Porter. I’d heard plenty of good things about CORPS before and that rather playfully spoils a witty tag line on one of BTRC’s banner adverts; “The best games you’ve never heard of.” BTRC translates as Blacksburg Tactical Research Center. GURPS certainly seems to have had a huge influence on EABA, not just with approbation for acronyms but for the worth of generic and flexible gaming mechanics. “There is a d20 alternative”, that’s another quote from a BTRC advert and this time it’s in direct reference to EABA. It’s a bit cheeky, but it’s true. Just as d20 is used by third party publishers for their supplements, so is EABA – the license text is in the download. There are even RPGs, such as Politically Incorrect Games’ The Colonies, available as EABA conversions. As far as gamers are concerned there are similarities in game style too. EABA lends itself to heroic game play, to cinematic action. The difference might be that EABA intended this whereas d20 inherited it. People will decide which of the two sets of rules are better but they do serve as alternatives. This review won’t get into the nuts and bolts of the EABA game system but will attempt a summary instead. It’s d6 based, one of the principles EABA holds to is that tossing handfuls of dice is fun. 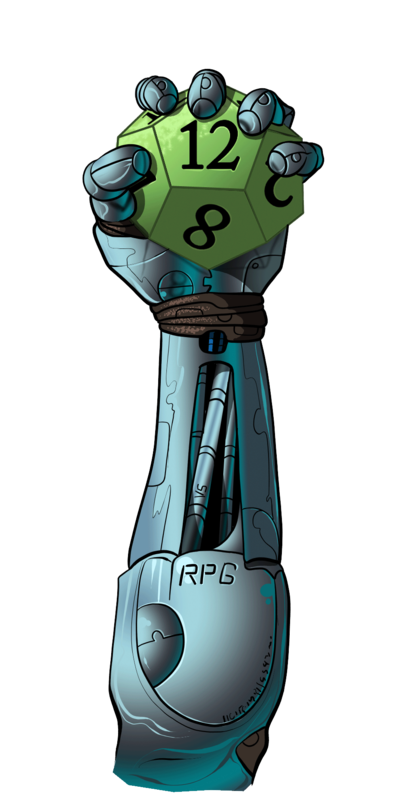 I don’t think we ever see handfuls, you’ll be feeling pretty confident if there are 4d6 bouncing around in your hand and feeling smug if you’re dropping 5 or 6 die on the table. It’s a Difficulty supported system; these d6s will be trying to beat a GM/rules set total. There’s some extra flexibility. Many rolls are termed “Best Three” where rather than using the total of all the dice dropped, the total of the highest three is taken. Fractions of dice are used too. Modifiers of +1 and +2 are applied to the total before an extra dice is. The progression of ability might look like 1d, 1d+1, 1d+2 and then 2d. There’s only ever d6 used so the side descriptor becomes redundant. Fate plays a key role in the game mechanics, always as luck and if the game setting asks for it then as a spiritual or magical element too. Players can try a luck roll whenever they want to and success on that gives them the option of adding a dice (or a +2, their choice) to a roll they need to make or of subtracting a dice from damage they might take. Every time a player rolls like this in a gaming session the difficulty for the next roll gets higher, this ensure that those with more points in Fate will be lucky more often. This particular mechanic is a good example of how the system encourages action and drama without needing to bias individual sets of rules (combat, for example) to one genre. The download comes with a skill list. It’s fairly complete but that’s not the point, the success here is the emphasis that just because a skill isn’t on the list doesn’t mean it can’t be in the game. Talk to the GM about it. The skill system also copes with benefits and drawbacks of specialities, skill synergies, advanced techniques, trained and untrained use. It does get a bit complicated at times, especially on the first on-screen read. The game is also well explained, contains useful examples and clears up pretty quickly. EABA makes the effort to get the rollplaying right the first time so that the GM and players can get on with it and concentrate on the roleplaying. EABA is point based. You put your character together by spending different points on different parts of your character sheet. As EABA itself points out this isn’t terribly realistic, real life has stupid weak people and strong smart people, but it is fair, all the characters are equal. The points system also means the games works as the generic rule set as intended. If you’re running a gritty, post apocalyptic, horror then characters will be built with very few points but if you’re indulging in a fast paced, super hero, romp then characters and NPCs will be put together with lots of points. This ties in well with the difficulty range; there’s no need to tweak the system for genres. Super heroes only need to spend the same amount of points on their scavenging skills as characters in the apocalypse survivor game to have the same chance of finding scraps amongst the rubble. Apocalypse survivors with 2d in strength will be able lift as much rubble as super heroes with 2d in strength; it’s just rather more likely that a super hero character might able to roll 8d for the rubble lifting roll. There are super powers in the EABA download. There are a few examples and instructions on how to create your own, game balanced, super powers. A similar set of rules is used for magic spells, readers are shown how to create their own spells but in this case there are rather more example spells. In fact, there’s an entire spell list to pick from even though it doesn’t compare to those fantasy RPGs with bulky chapters dedicated to nothing else. EABA does trump those same fantasy RPGs when it comes to fantasy battles though. EABA actually comes complete with a battle system of its own. The battle system is in the Minutia chapter along with such gems as plain English technology level rules, drugs, vehicles and even the cost of living. The concluding chapter finishes with lists of gear, hex maps to print out as well as a choice of different character sheets. There are some exceptionally nice PDF tricks on the blank character sheets. You can actually click on the character sheet page and type in your character’s attributes, skills and equipment. Okay. You can’t go as far as saving this information unless you have the correct software but you can print it out. In fact, on a Windows computer you might achieve some success by pressing the Print Screen button on your keyboard and then pasting your screen capture into MS Word. There are other technological plus points in EABA, ones worth noting. The whole product is fully bookmarked and hyperlinked. If you see something interesting in the contents or index page then you can click on the page and go straight there. There are embedded pop-up notes on a few of pages, little icons that actually hold a side asides. EABA is a colourful download – and it uses colour to good effect. Advanced rules are in blue text, options for the GM to consider are in red and examples are in green. The “Advanced Combat” chapter, therefore, is almost entirely blue and green. There are just a few embedded illustrations in EABA, they’re found in the Tech Level section as useful visual examples of the sort of technology from the eras in question. This doesn’t mean that there aren’t many pictures in the download though. Full-paged illustrations are used at the start of every chapter. These high quality computer graphics are great to look at but are also responsible for EABA’s weight of about 16Megs. The colour copy comes bundled with a grey-scaled version for those of us without super expensive printers, this is really useful but bumps to total download weight to over 20Megs. EABA’s charm is undeniable. I can’t honestly think of a type of game that EABA isn’t suitable for. There are only rules here – that’s the whole point, I suppose – but that means there is no game world bribe to get to. There’s no campaign setting that requires you to get to grips with yet another set of rules before you can play in. That can make EABA a bit of a struggle to read at times, a set of rules isn’t something you can sit up with late one night and read in the place of a novel. On the other hand, EABA’s a genuinely useful tool for those of us looking for that one set of mechanics to carry through into many different games. The “Jack of All Trades, Master of None” issue doesn’t seem to bite too hard but it’s there, the download would need to be four times the size and include stats for fantasy monsters, through mecha and all the way to Lovecraftian style horrors to completely avoid that trap. EABA’s successes are where they count. The system achieves what it strives for; its fast enough to be fun and real enough to be gripping, it’s simple enough to be welcoming and detailed enough to be satisfying. The first pair, the fast and fun, is the very much stronger combination. It’s an ancient review… but you’re welcome :) Thanks for exploring!